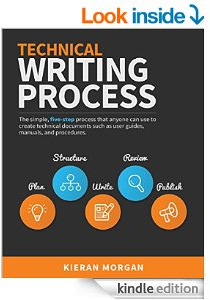 Oops, I’m late to my own party – before I had a chance to announce the publication of the e-book edition of the Technical Writing Process, several copies have been sold without me even realising. How did this happen? Well, I pushed the ‘publish’ button on the e-book edition on Amazon several days ago, fully expecting that it would take that long to get through Amazon’s review process (they advise something like 12-72 hours). It was published within several hours, much to my amazement, and over the week I’ve been busy working on some urgent tender documents so haven’t had a chance to check how it’s going. I am absolutely thrilled, but won’t be following up with a broader announcement till the paperback edition is published. Due to a couple of false starts with the graphic design, this has taken several months longer than I’d anticipated, but with the help of my wonderful designer Sanja Spajic I’m now back on track and close to publishing the paperback edition (we’re now up to Chapter 4). Incidentally, I am impressed with how well Amazon’s default converter handled the MS Word document, and wonder if this had something to do with the speed it went through Amazon’s review. The best results (I tried a few test conversions) seem to come from keeping the MS Word stylesheet very simple and clean – sticking to the default heading and paragraph styles – and this seems to have resulted in a very clean-looking e-book (at least to my eyes – I might be slightly biased!). © 2014 Kieran Morgan. Terms & conditions apply.